Please check our Facebook page for the latest news from St. Stephen's Cathedral. Welcome to the website of St. Stephen Orthodox Cathedral. We are a multi-ethnic community, welcoming Orthodox Christians from all backgrounds as well as inquirers who want to learn more about the Ancient Christian Faith. English is the main language of our parish and it is our hope that many of those who visit and pray with us will be able to become part of the life of the original Christian Church through the Apostolic tradition that has been preserved and is continued to be practiced in the Eastern Orthodox Church. We hope that this website will help you learn more about the life of our community. Please check our calendar for the schedule of services and our Facebook page for current news. 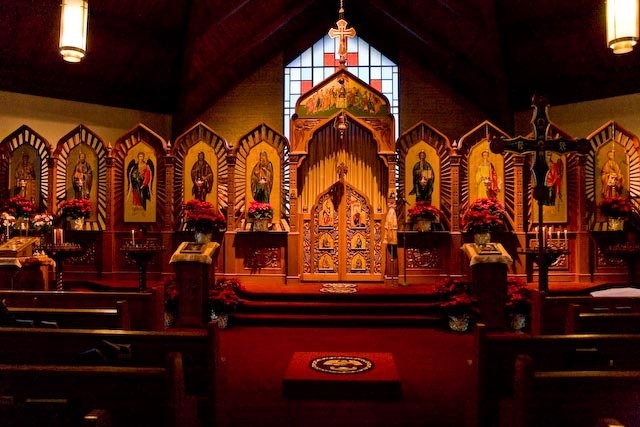 Because of the significant presence of Russian-speaking immigrants in our area we also have services in Slavonic every Sunday morning and on feast days. For more information, contact us at novogodnyball@verizon.net. Every Sunday during the school year following the Divine Liturgy. Please see Father Victor if you are interested in having your child participate in the Sunday School Program.